This craving all started a few weeks ago when I went to our local Cowboy Festival, and had the most amazing peach cobbler. My whole family was obsessed. Then the following day, my dad made some, and then I just had to get my hands on making some too! Since my mom loved it so much, I decided to make it as a Mother's Day dessert. I made it in my Staub cast iron pan since at the festival, they made it with a cast iron too. It was a big hit, but we had no leftovers and I wanted more. 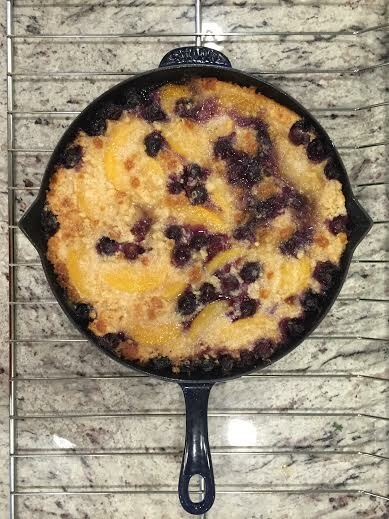 So yesterday I, of course, made another cobbler, but this time it was peach and blueberry cobbler. My recipe takes about 5-10 minutes to prep and it's almost effortless to make. 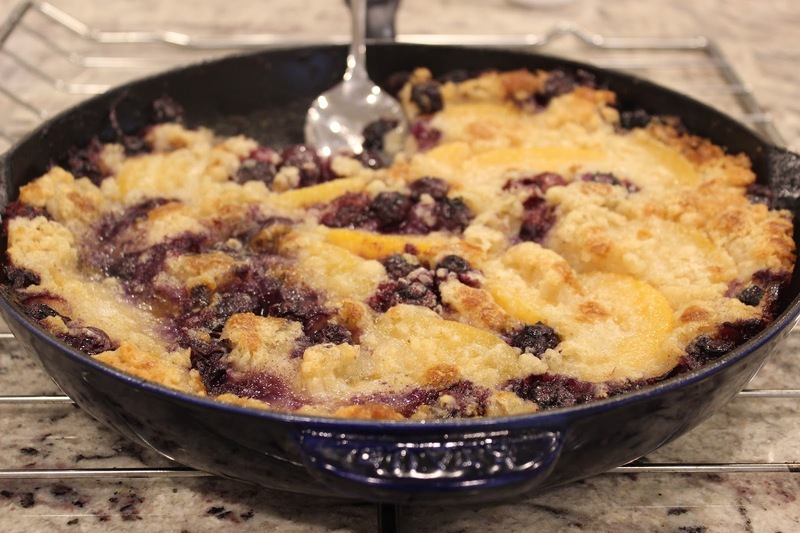 And of course there are so many ways to go about cobbler since cobblers come in different shapes and sizes and the one I make is very, very easy. I don't have too much time in my hands because of Jonah so I like recipes that require short cuts, or are just so easy that the oven does all the work for me. 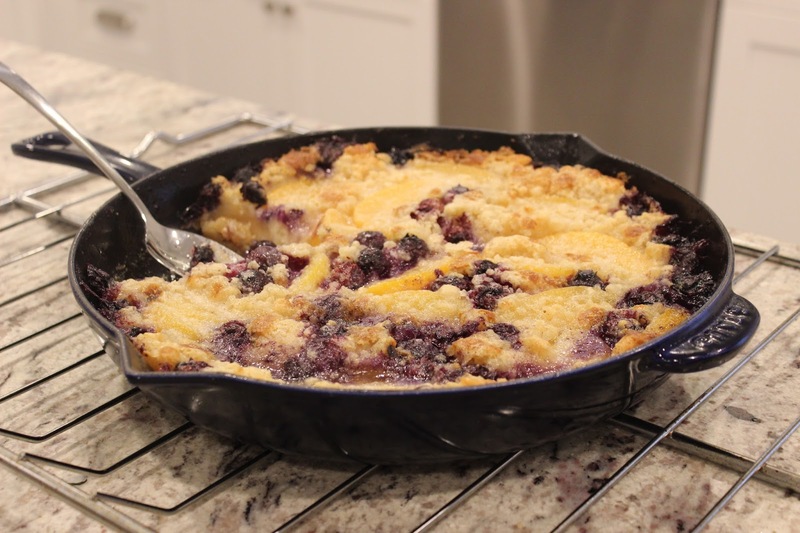 SO, you ready for the easiest cobbler...here we go! First, you need a large cast iron pan or if you don't have one, a square casserole pan will work. 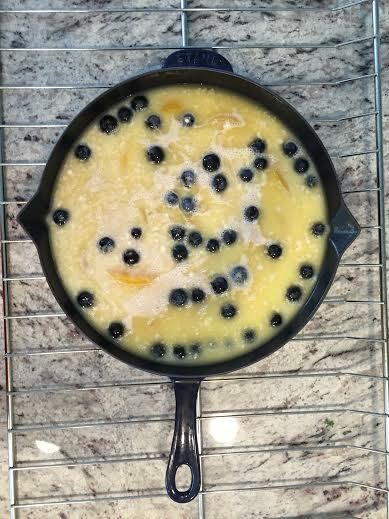 Evenly cover the pan with a drained can of peaches. I used a 29oz can and small package of washed blueberries. 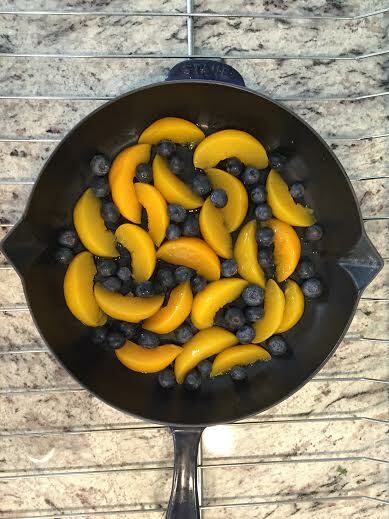 Then you need two sticks(1 cup) of melted butter, and pour it over your peaches and blueberries. Then in a separate bowl, mix 2 cups of flour, 2 cups of milks, 2 cups of sugar(i used 1 cup of white sugar and 1 cup of brown sugar) and 2 teaspoons of baking powder and mix into a batter. You can emblish the batter if you'd like with a bit of vanilla extract and cinnamon too! 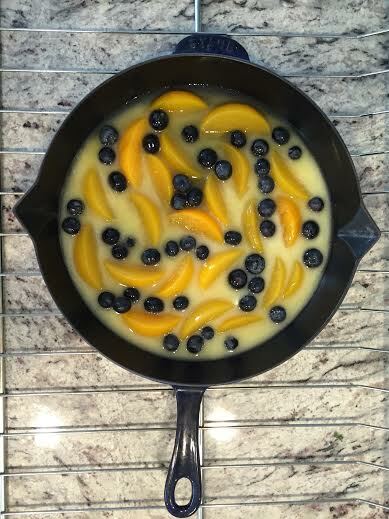 Then pour the batter over the peaches, and blueberries, and butter. Then it's ready to go into the oven!! Make sure you preheated your oven at 350 degrees F. Once your oven is ready and warm, pop your pan in, and bake for about 40 minutes or until you have a golden brown top and edges. And that's it!!! Super easy, right? Once it's cooled down a bit, serve it with some whipped cream, ice cream or just simply enjoy it alone! I hope you guys try it because it turns out delicious and it looks a lot more impressive in pan when you have guests over! Let me know if you guys try it, I'd love to hear. Happy Thursday, the weekend is almost here! Cobbler it up!